Ba Gua, also known as Ba Gua Zhang, is recognised as one of the three major “internal” Chinese martial arts, including Tai Chi and Xing Yi. Of the three, Ba Gua is the most powerful because it is the most flexible and dynamic. It is based on the theory of continuously changing in response to the situation. 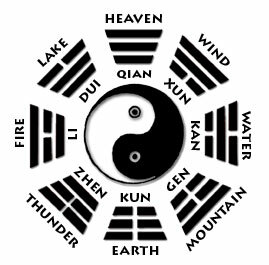 The words Ba Gua translate as “eight trigrams”, a reference to the symbols of the ancient Chinese text of divination: The I Ching, or “Book of Changes”. The eight trigrams are arranged in a circle around the Dao (Ying-Yan) symbol. The concept of Ba Bua is used not only in martial arts, but also in other areas of Chinese culture, such as Daoism, feng shui, navigation, and predicting the future. The I Ching is one of the treasures of Chinese culture (best translation: Alfred Huang). The word Zhang means palm, and refers to the fact that this martial art emphasizes the use of the open hand, rather than a closed fist. The creation of the Ba Gua martial art is attributed to Dong Haichuan in the early 19th century. According to tradition, Dong learned from Daoist masters in the mountains of rural China. He originally designed Ba Gua as a type of meditation, walking in a circle while reciting mantras. Later this was combined with martial arts Dong had mastered in his youth, to to create a new style based on the ability to apply martial techniques while in constant motion. Walking the circle is the basis for all existing Ba Gua styles. The practitioner walks in a circle, while holding various postures with the upper body, or executing palm changes – patterns of movement which train the body mechanics, generate Chi (or energy), and form the basis of Ba Gua’s fighting technique. You are here: home >> The Disciplines: Internal Martial Arts >> What is Ba Gua?